Seven-times world champion Michael Schumacher turned 50 on Thursday as Formula One and his fans paid tribute to the sport’s most successful driver with a mixture of celebration and sorrow. The German great, who retired in 2012 after a comeback with Mercedes, has not been seen in public since he suffered severe brain injuries in a recreational skiing accident in the French Alps five years ago. “Our champ turns 50 today. We’re all with you Michael #KeepFighting,” Ferrari said, celebrating a driver who won five titles in a row for the Italian team in a golden era between 2000 and 2004. “Michael, you’ve always been a fighter and you always will be,” former Ferrari boss Jean Todt, the president of the sport’s governing body the International Automobile Federation (FIA), said on Twitter. Schumacher now lives a sheltered existence at the family’s mansion by the shores of Lake Geneva in the town of Gland, Switzerland, with his wife Corinna and children highly protective of his privacy. “You can be sure that he is in the very best of hands and that we are doing everything humanly possible to help him,” the family said in a rare statement on Wednesday that also announced the launch of a Michael Schumacher app. Thursday’s focus was on celebrating a champion who holds the records for most titles and wins (91), even if Britain’s five-times champion Lewis Hamilton is closing in. Hamilton, who raced against Schumacher at McLaren before taking the German’s place at Mercedes in 2013, hailed his fellow-champion on Instagram and said his legacy would last forever. 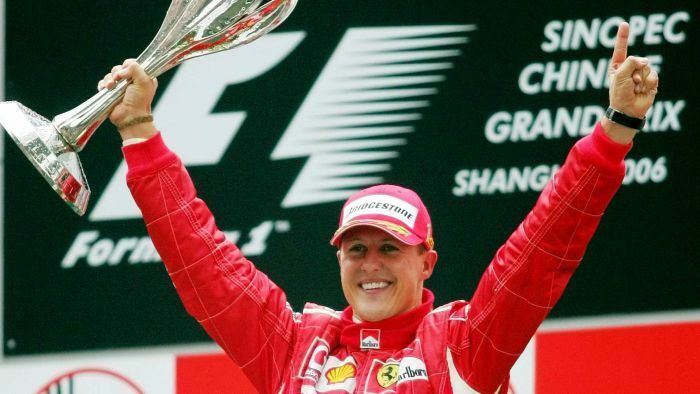 The Formula One website declared this “Schumacher Week”, with stories and interviews, while Mercedes team boss Toto Wolff spoke of the German’s “tremendous impact”, saying he had shaped and changed the sport forever. “As a driver, Michael took Formula One to a whole new level with his attention to detail and his technical knowledge,” added Wolff, whose Mercedes team funded Schumacher’s Formula One debut with the Jordan team at Spa in 1991. Formula One’s managing director for motorsport, Ross Brawn, a key player in Schumacher’s career at Benetton and Ferrari and also as Mercedes boss before Wolff, spoke from the heart. “I think one of the things I’d say about Michael from throughout his career is that people who worked with him never had a bad word to say about him,” the Briton said in a Formula One podcast. Schumacher spent 18 seasons, over a 21-year period, in Formula One and took at least one win in 15 successive campaigns (1992-2006). Hamilton has done that for 12 in a row. The German’s career was also clouded by controversy, his achievements countered by the feeling he benefited from the best car and a subservient teammate throughout his Ferrari years. He is also a family man, fiercely guarding his privacy away from the track during his career. “Happy Birthday to the best dad,” she said in an Instagram post accompanying old photographs of her smiling father in racing overalls.